Matrix assisted laser desorption ionization (MALDI) or electrospray ionization (ESI) allows the soft ionization and transfer of analytes to the gas phase. Time-of-flight (TOF) mass spectrometric analysis provides high-resolution, exact mass measurement and accurate isotope distributions of positive or negative ions for identification. This allows for chemical identification of intact molecular and cluster species, transferred from solution (ESI) or a solid matrix (MALDI). Recent advances in technology have led to the efficient coupling of ion-mobility analysis with high resolution mass spectrometers. Ion mobility spectrometry (IMS) provides a means to separate ions based on their shape and size, providing complementary information to that obtained via standard mass spectrometry. The Synapt-G2 HDMS is the first commercial instrument of its kind, offering flexibility in terms of ion source (MALDI, nanoESI, ESI) and sample analysis, coupling a high resolution TOF mass analyzer with a travelling wave ion mobility (TWIMS) separation cell. Thus, the instrument has both the capability to obtain high resolution ESI-/MALDI-TOF mass spectra, or, with application of IMS, to obtain 2D structure-mass correlation maps. 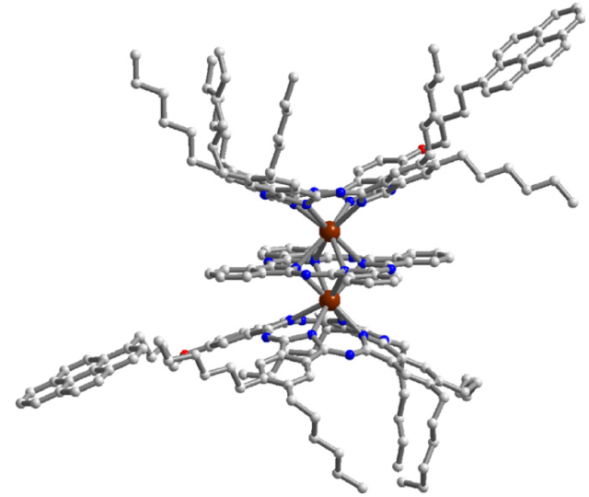 Ions of interest may also be mass selected in a quadrupole mass filter and have their individual chemistry (e.g. via collision induced dissociation) probed. Fig. 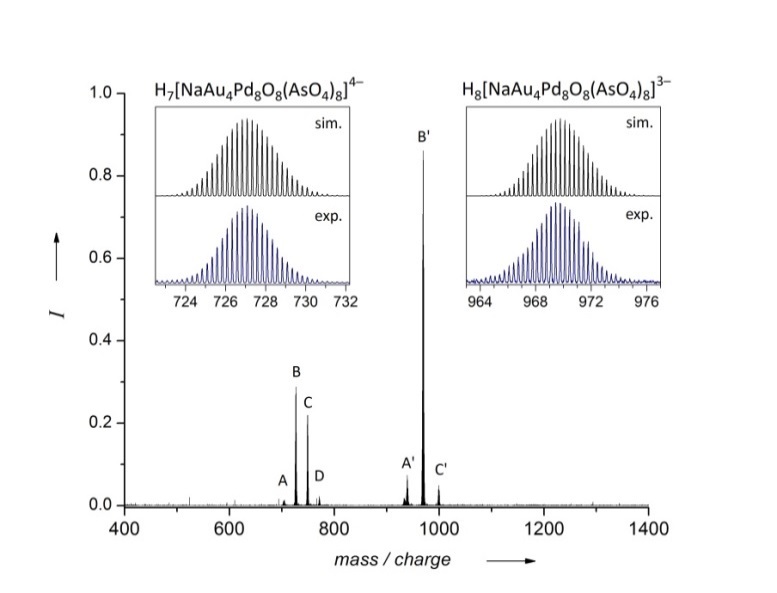 1: Negative-ion electrospray mass spectrum obtained from a solution of Na-Au4Pd8 in H2O/DMSO. The two insets highlight peaks B and B’ and compare their isotope distribution to the simulated ones for the molecular ions as labelled. (a) Schematic structures of the two possible stacking configurations for Tb2(A3B)2Pc complex: a symmetric one (on the left) and an asymmetric one (on the right). 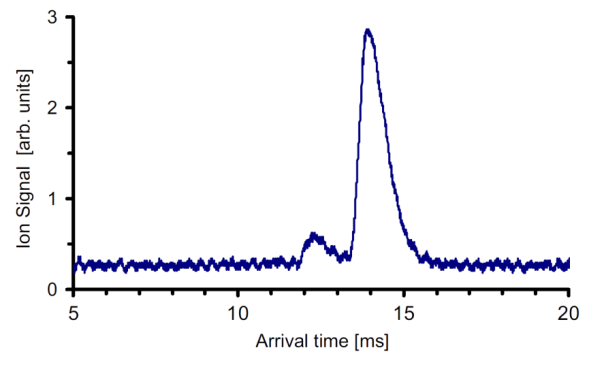 (c) IMS arrival time distribution of the anion of Tb2(A3B)2Pc indicating the presence of two different isomers.